When it’s too hot to switch on the oven, we turn to the outdoor bbq or meals that require little or no heat. Unless you’re 8 years old, the satisfyingly coolness of ice cream just won’t do for dinner fare. Salad, on the other hand, will do just fine for that cool ingredient in any of your fantastic summer meals, that everyone will enjoy. While salad is generally considered an appetizer (in Europe it is usually served after the main course) it’s easy to bulk it up to make it a featured dish. Take a chicken Caesar salad, for example. With fresh romaine lettuce, grilled chicken, delicious dressing, croutons, and (optionally) vegetables like tomato or red onion, this salad takes the spotlight, not the sideline. 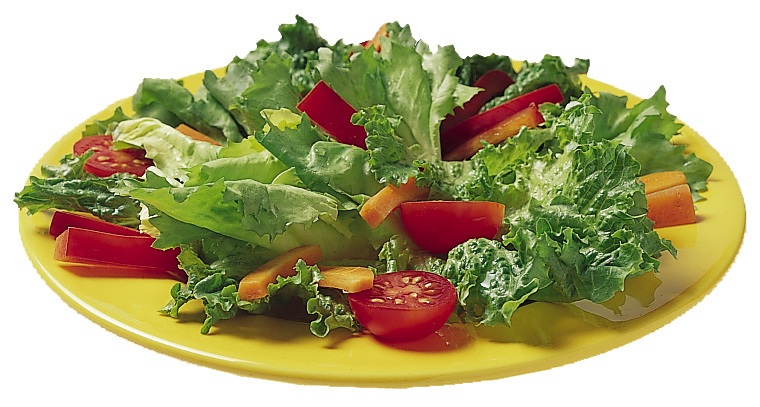 Here’s a recipe and a few tools to make fresh salad a piece of (extremely healthy) cake. Salad spinners are one of the most useful tools for preparing salad leaves. As with all fresh veggies, it’s always a good idea to wash your greens. But since the oil used in dressing and the water from the washing won’t mix, you’ll need to dry them, too. Drying them with a cloth towel can get – for lack of a better word – icky (lint! ); that’s where the salad spinner comes in. It twirls your greens around at high speed, flinging off the water and making them dressing-ready. 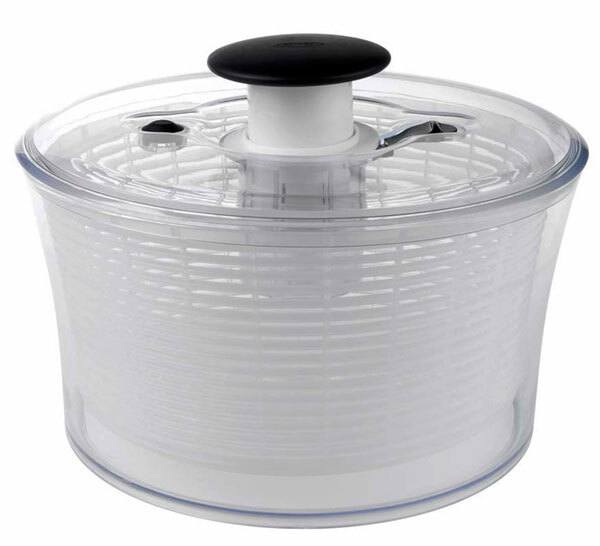 We really like the Oxo Good Grips Salad Spinner. It’s fast and easy to use. The spring-loaded palm-operated pump button really gets it moving. You stop the action with the handy dandy brake button, then lock down the palm button for storage. Its grippy base helps keep it steady on the counter. The acrylic bowl is great for serving, and you can use it to store the washed leaves in your fridge (if you have the room) . This handy gadget comes in a smaller size as well, the Little Salad & Herbs Spinner, for small servings, herbs, and berries. After you’ve washed your salad greens and chopped up your various favorite veggies, you’ll need a dressing. Now you could buy one from the grocery store, but wouldn’t you prefer something home-made? It’s far easier than you might think to shake up a vinaigrette with simple ingredients you already have in your pantry. With a product like the Oxo Good Grips Salad Dressing Shaker, you’ll find fresh dressing is easy and so quick to prepare. 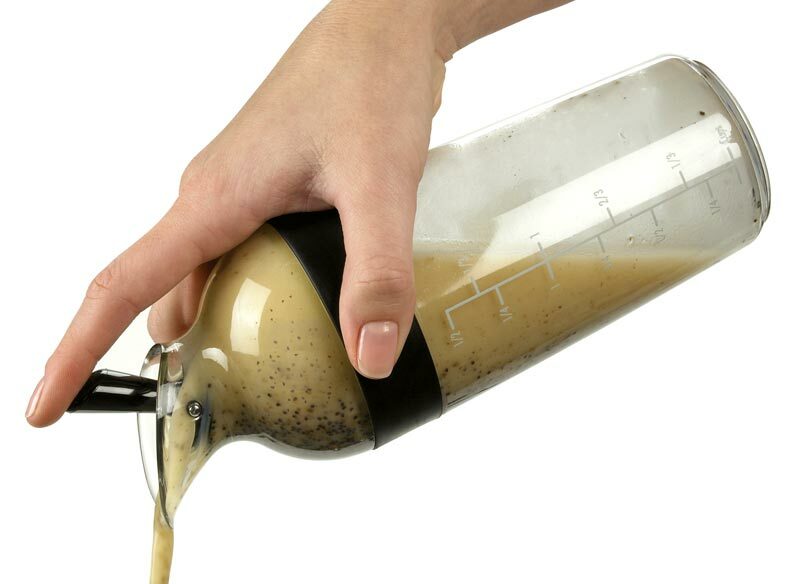 Simply gather your ingredients (example recipe below), pour them into the bottle, shake that dressing maker, and serve! 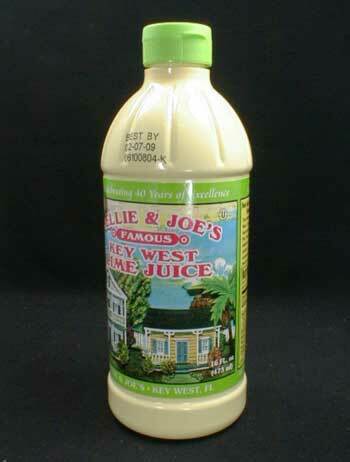 Here’s a simple and easily adaptable salad dressing we like, courtesy of Nellie & Joe. Combine all ingredients in dressing maker, and shake well to combine. Chill. Shake again before serving. This slightly sweet and tangy dressing is excellent over baby salad greens such as spinach or arugula – try it with sliced shallots, radishes, and mandarin oranges. There are loads of recipes out there for cool summer salads. Go to it! Stop by our Italian Market store this weekend to watch our salad spinners and dressing shakers in action. Liana will be serving up fresh salad for your tasting pleasure! And we have two special offers on the table at our store. First up, with the purchase of a salad spinner, you’ll get free Oxo 9″ Tongs. Second, you’ll have a chance to enter our free giveaway for an Oxo Good Grips salad set – a Little Salad & Herbs Spinner and 9″ Tongs could be yours; no purchase necessary. Don’t miss your chance to win! Love the dressing recipe! Thanks for sharing!